Fashion designer Katherine Hamnett leads calls to ban dangerous herbicides in Hackney. A campaign has been launched by fashion designer Katherine Hamnett to ban the use of dangerous herbicides (aka weedkillers) in Hackney. In an open letter to Hackney's Mayor, Hamnett has called on the borough to immediately stop it's use of Monsanto's glyphostate based herbicide. Hackney prides itself on its parks. But the Council’s use of toxic glyphosate-based herbicides could be posing serious health risks to local people barbecuing, eating and playing there, as well as park employees and council workers. It also threatens a variety of bees and other wildlife. It's not only dangerous to humans and animals, it's classified as 'dangerous for the environment' by the EU. Here are some extracts from Hamnets letter. Many of us in Hackney...are demanding Monsanto's Glyphosate based herbicide banned in the Borough. It was known to cause birth defects since before it was licensed. It is also persistent in soil and water. It is not safe. Soil tests taken from the wildflower meadow and basketball pitch show evidence of Glyphosate residue present in both. You and the Council have a duty of care for your citizens. I demand that you close the basketball pitch immediately. It needs to be hosed down and the surface re-tested for Glyphosate residue and not re-opened until it is clear. 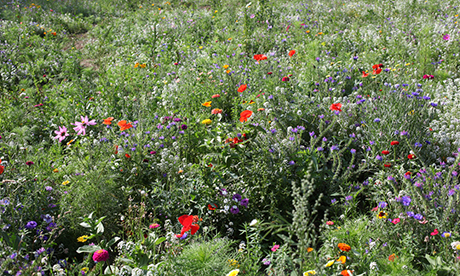 The wildflower meadow is a bigger problem as it is in the soil and cannot be washed off. Signs alerting people to its presence must be put up. The area should be fenced off. New soil tests must be done, and the results displayed in the area. People have the right to informed choice whether to go there or not. The concentrations of Glyphosate are quite low, but do we really want ANY concentration of something known to cause birth defects anywhere in our environment? Is low risk of birth defects acceptable?? Is any risk of birth defects acceptable so we can keep our parks and streets weed free? Ask any mum. The answer you will get is, HELL NO. Sign the petition below and join the campaign to ban dangerous herbicides in Hackney.